The North Korean capital of Pyongyang was largely razed during the Korean War and the buildings that rose up from the ashes provide some of the most striking examples of socialist architecture. And more recent architects in the cloistered nation have added grandiose—though sometimes unfinished—landmarks to its urban landscapes. Kumsusan Palace of the Sun (Kim Il-Sung Mausoleum), Pyongyang, built in 1976. It was the official residence of the head of state until the death of Kim Il-Sung in 1994. The Pyongyang Ice Rink, on the bank of Pothong river in Pyongyang, built in 1982. It has 6,000 seats and is mainly used for figure skating, ice skating and ice hockey, but table tennis and volleyball have also been played here. Three Revolution Exhibition (the ideological, technical and cultural revolutions of Kim Il Sung), Pyongyang, in the building of the former Industrial and Agricultural Exhibition Hall, built in 1946, improved in 1983. Since then, it has a Saturn-shaped planetarium. 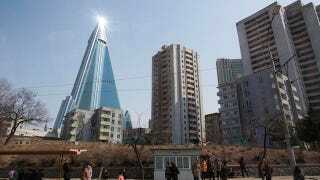 The 43-story and 469-ft (143-m) tall Koryo Hotel, Pyongyang, the second largest hotel in North Korea, opened in 1985. The 105-story Ryugyong Hotel—construction began 1987, but was halted during the 1992 economic crisis of North Korea caused by the fall of the Soviet Union. The Egyptian Orascom Group, which built and run the 3G network of North Korea, continued the work on the building in 2008, but its interior is still unfinished. Hyangsan Hotel, on the banks of the Myohyang River, North Pyongyang Province, opened in 1986, renovated in 2010. The Rungrado 1st of May Stadium, Pyongyang, the largest stadium in the world by capacity (150,000). It opened on May 1, 1989. It is used for the Mass Games (Arirang), football matches and athletics events. Mangyongdae Children's Palace, Pyongyang, built in 1989 as a public facility dedicated to after-school activities. The Kimilsungia-Kimjongilia Exhibition Hall, constructed in 2002 for massive flower exhibitions and festivals.